I could have sworn, just yesterday I was dropping her off for her first day of kindergarten and here she is, heading into 7th grade. You know the old adage, “time files the older you get”? Okay, maybe not…maybe that is just a Lacey-ism I came up with in my head. But, anyway, it’s true. The older I get, the faster time seems to go. 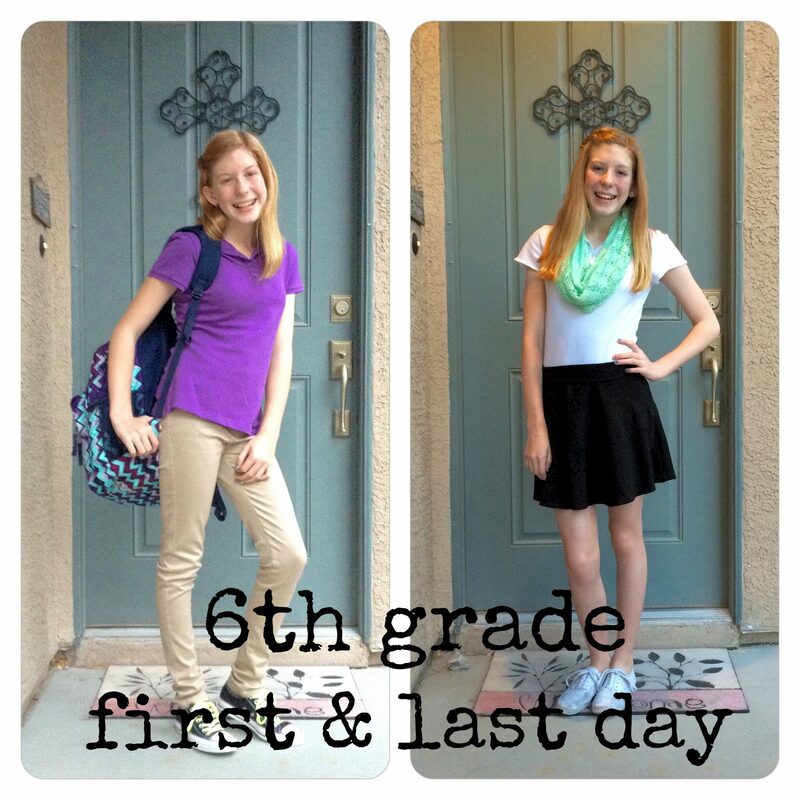 This was her first year in middle school AND her first year at Roy Martin Middle School, a magnet school with a pretty rigorous International Baccalaureate program. It was also a LONG year, with Jacey’s days starting at 0430, so she could catch the bus and often not getting home till almost 1900 after swim practice. But she trekked through and continued on her path of success through determination and hard work. The year started with all the normal courses on the 6th grade level and core classes accelerated. A few weeks in, we got a notification that Jacey was accepted into the extra accelerated math program. The 6th grade year consisted of math 6/7, 7th grade will be Algebra I and 8th grade Geometry Honors, earning 2 math credits before she even gets to high school. We were a little worried, with the class load she already had, but for no good reason. 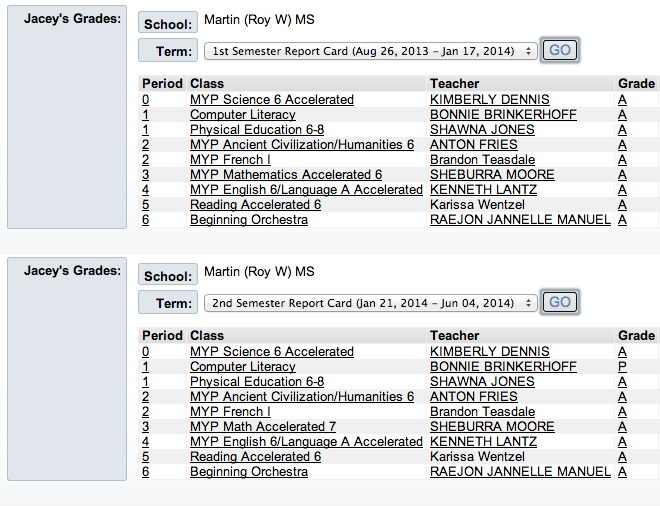 She nailed it and all her other classes, finishing out the year with all A’s for her semester grades. Middle school also brought a choice of electives. In 6th grade, one had to be a foreign language and one a fine art. Jacey chose French and orchestra (viola). While she is not a fan of French now, she fell in love with orchestra, even making advanced orchestra for next year (normally 7th graders end up in intermediate orchestra). All the while, carrying that school load and viola practice time, she kept right on swimming. 2 hours a day, 5-6 days a week plus strength training and pysch sessions, 3-4 times a week (oh, and youth group on Wednesday nights). I truly have no clue how she has that much energy and determination, but so long as she keeps putting forth the effort, we will be there to help make it happen to the best of our ability. In February, at the end of short course season, we traveled to Bakersfield, CA for the 2014 CCS Winter Junior Olympics. She qualified/swam in 7 individual events and 2 relays over 3 days. She even made consolation finals in 1 event. Pretty darn impressive, for a kid that screamed bloody murder the first time a wave touched her feet at 3 and has only been swimming competitively for the last 2.5 years. Between her passion and her amazing coach, I just know she is going to go far! For now though, we are enjoying the ever so slightly calmer summer (twice a day practices anyone). Next month is summer junior olympics in Fresno, CA and then Jacey’s jets off to Texas for camp and visits with grandparents. Before we know it, I’ll be dropping her off for her first day in 7th grade. Sigh.